Gold prices have steadied above $1310, after rallying for two days straight on global growth concerns. The bounce was likely triggered by uncertainties around Sino-US trade war and concerns of slowing global economic growth. Trade tensions resurfaced after U.S. President Donald Trump said that he had no plans to meet with Chinese President Xi Jinping before the deadline on March 1, to try and achieve a trade deal. It is worth noting that Trump has vowed to hike tariffs on $200 billion worth of Chinese imports to 25% if the two sides fail to reach a deal by then. However, the upside for the yellow metal could be capped by the strength of the greenback which rallied for 7 straight days. 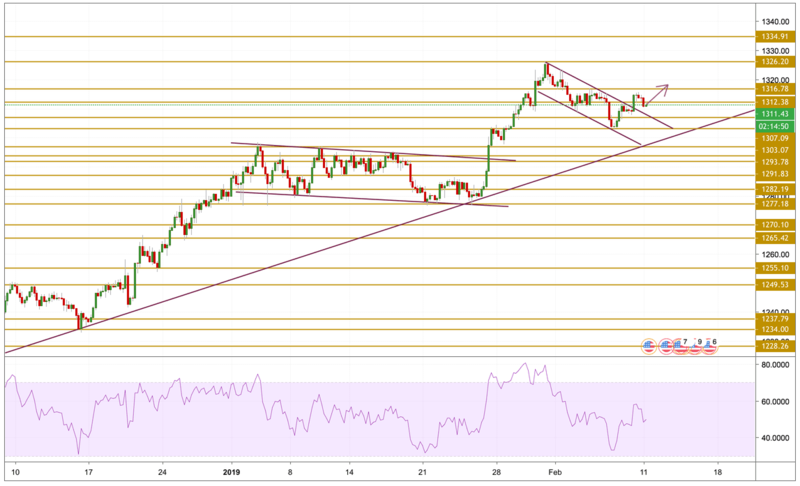 Gold prices printed a low of $1302 on Thursday before rallying back to $1314 on Friday breaking the falling channel presented on the chart. The breakout confirms that bulls have taken control again, with the price currently holding above the 1310 level with an improved momentum. We expect an uptrend continuation and we will be focusing on the $1316.78 resistance level.